Two of the Zerkalo 12 inch EP's are finally available to purchase from the Clone website and presumably your local record shop. The 12" on Frustrated Funk, 'Experiment Zero', is still imminent though. Samples of all the tracks can be heard at following links. 'Stoi Storoni Zerkala' Pt.1 12"
'Stoi Storoni Zerkala' Pt.2 12"
There is also one live show listed for Liege, Belgium on 16th October 2009 on their MySpace. Also, according to to the Zerkalo MySpace, Victoria Lukas and Julia Pello, her partner in Weltgeist, have been busy writing an essay about Andrei Tarkovsky called 'Tarkovsky's Mirror as Found Object" which is featured in a book which can be purchased online through Final Object. The following text from it is provided by them on their site. "[the artist] observes people and traverses worlds; he is material fused with the spirit constantly on the path of overcoming. He awaits and labors for the daylight of a perfect moment, for a sense of unique joy that may elevate him above his former selves, despite nostalgia, despite decay or the effacement of power in the passage of time. This is where poetry’s first lines shudder to be spoken. Poetry (not simply as a term of written form) is an exercise in free will whereby the poet submits himself to flashes of reality from beyond the mirror." More details are emerging about Dopplereffekt's involvement in the 'Off Center' show being promoted by BlackRed to be held on 17th October in Leipzig, Germany. My German isn’t great but they appear to be being listed as doing a sound and video installation alongside some other artists at another venue during the day which will culminate for them with a live show in a club that night. Would love to get some images of their installation. Can we expect more of this? 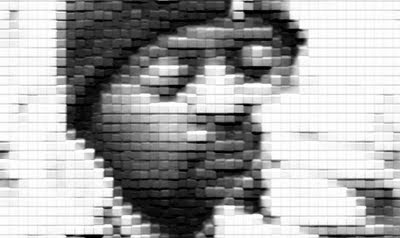 Dopplereffekt are also now confirmed for a show at Rex Club in Paris on Sat 3rd October 2009. 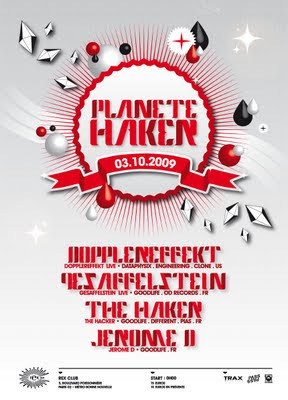 Dopplereffekt are also playing in Dresden, Germany on 9th October 2009. Just in but a bit late if you want to go! Dopplereffekt finally make it to Russia, they play a live show in Moscow 25th September. Just got a heads up that Dopplereffekt do their first ever face to face interview and photoshoot in the next issue of The Wire. It will be in the October issue which is out in a couple of days I'm told. The journalist Derek Walmsley conducted the interview when they were over to play their London debut at Plex earlier this year. Hopefully this will be illuminating and it should help in exposing them to a largely sympathetic audience as well. No images on their site yet but will post them here when there are. 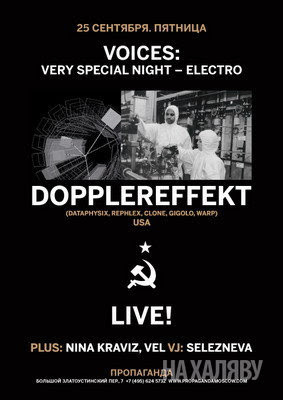 Don't forget Dopplereffekt are announced to play live in Leipzig, Germany on Sat 17th October 2009 as well. Found a new official Zerkalo website as well. Pretty minimal but good. This year it is the 7th anniversary of James Stinson's death and while I like to think we remember him everyday I guess I should mark it, a day late I know, with a post. I recently found the following touching and penetrating tribute to him written by Christine Hsieh for Remix webmag which I hadn't seen before and am happy to archive it here for this purpose. I know there has been at least one radio show tribute to him this week but if anyone knows of anything else happening let me know. The best place to reconnect with James outside of his music would still have to be the radio interview with him which can as always be heard here. September 3, 2002, came and went like any other day — until that evening, actually, when a message, startling to most, raced through the electronic-music world with lightning speed. James Marcel Stinson, the driving force behind the enigmatic Drexciya outfit, was dead. No fanfare, no fuss and no media hoopla surrounded Stinson's passing. Eulogizers had little to work with, save for a smattering of interviews, cryptic liner notes and sketchy biographical information. But, tellingly enough, what serves as his greatest legacy is the impressive body of work he left behind and the arresting, compelling and ultimately political message buried within it. Details of Stinson's life are beside the point, really. What is known is that the story of this remarkable man began in Detroit. Characterized as a racially divided, gritty urban landscape, Detroit somehow became the locus of fantastical, emotional robot music created by free spirits and creative souls, and Stinson was very much a part of the intensely serious group of producers and DJs who formed the second wave of techno. The mechanical whirs, clicks and pops championed by the original innovators burrowed their way into Stinson's consciousness, and henceforth, he devoted his life to translating musical ideas into physical space. Beginning in 1991, Stinson and his longtime collaborator (who remains anonymous to this day) unleashed their technoid electro through a series of EPs on labels such as Tresor, Hyperspace and the infamous Underground Resistance, which is run by the equally reclusive “Mad” Mike Banks. 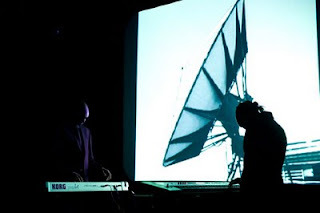 The duo, producing together as Drexciya, brought the electronic-music world to its knees. Their name, according to the liner notes of The Quest (a collection of their UR output compiled by Tresor in 1997), refers to a fictional Atlantean subcontinent inhabited by a marine species spawned from the thousands of pregnant African slaves who were callously tossed overboard by slave traders because they were troublesome, sickly cargo. This mythical underworld comes to life through Drexciya's music — slithering onto land and into the airwaves as a myth translated into fantasy, distorted by machines and electrified with soul. Stinson's work as Drexciya revolved around this myth. Indeed, their earlier recordings, with EP titles such as Bubble Metropolis (UR, 1994) and The Unknown Aquazone (Shockwave, 1994), are inspired “conversations” with this imaginary world. When they dropped their first full-length artist album, Neptunes Lair on Tresor in 1999, the Drexciyans arrived at a fantastic level of fame and praise — especially for a group with no public profile. Stinson was, and shall remain, a true visionary. His music struck a chord with those who sought an outlet from the intense pressure of socially stratified and increasingly mechanized life — not because it provided the all-too-easy answer of quick release and careless escape, but because lurking underneath the nebulous, often acidic and always intriguing surface of his music lay an uncompromised vision of hope, survival and tenacity.